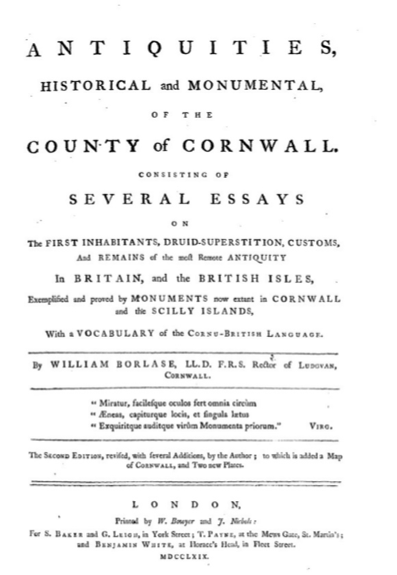 It’s a pleasure to announce the appearance of a new Curious Travellers publication in the latest issue of Romanticism. 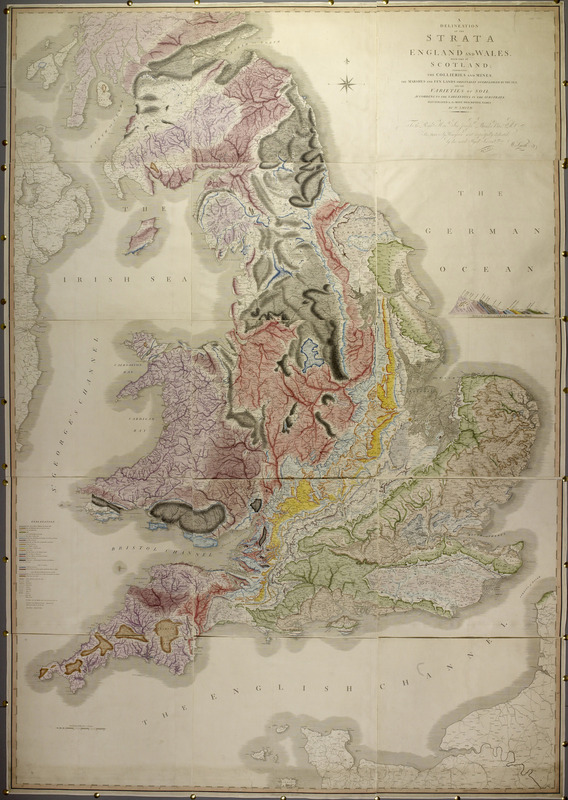 This article, titled ‘A Kind of Geological Novel’: Wales and Travel Writing, 1783–1819’, is a particularly project-based piece that started out as a paper for our ‘Layered Landscapes’ symposium in Cardiff in 2015, which commemorated the bicentenary of William Smith’s pioneering geological map of (mainly) England and Wales. I became fascinated with Smith’s work, which is part map of the mainland ‘underscape’ and part pure work of art; it was all too easy to get lost in the colours and shapes running across the beautiful and somewhat epic object on display in the National Museum of Wales. The map itself contains a compelling and long-running story that represents travel as much as any of the other texts we’ve been working with on the project. 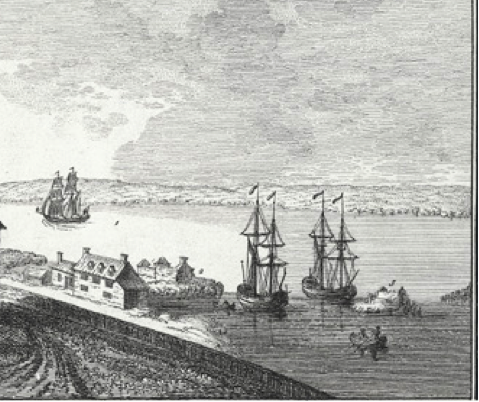 It became the starting point for an exploration of Welsh travel writing as a particularly sedimentary genre, a form in which material (research, first-hand observation, chance happenings) piles up and settles down in the course of a tour committed to paper. The title comes from Charles Darwin, who made some of his first geological observations in Wales, and who saw – as did Thomas Pennant before him – far-reaching narratives stored away in Snowdonia’s rocky landscapes. The article is open-access and freely available to read here. Nigel Leask on Ossian and the Highland Tour (Journal for Eighteenth-Century Studies, 2016). Alex Deans and Nigel Leask on Pennant in Scotland and Wales (Studies in Scottish Literature, 2016). This entry was posted in Research Blog on 10th August 2018 by Luca Guariento. 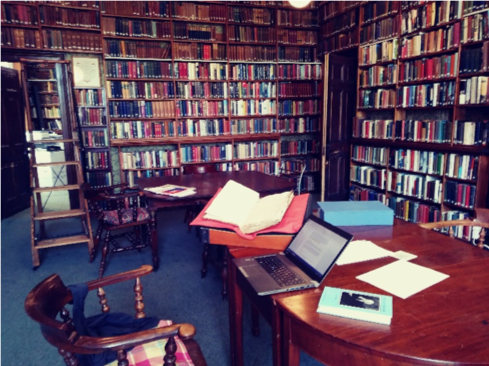 Our colleague from Oxford University’s Early Modern Letters Online, Dr Miranda Lewis, gives an account of a transcribing workshop organized for History students at the University of the West of England, Bristol, in March this year. Many thanks to her, and to Dr Sarah Ward of UWE, for making this event happen! This entry was posted in Research Blog on 24th April 2018 by Luca Guariento. Saturday 25th March, it’s a cold but beautiful bright morning. Evelyn and Flora are off to see the Tove Janssen exhibition in London (my daughter’s 17th birthday treat) so I am home alone with Max the cat. Its been an extraordinary heavy week, the final teaching sessions of the semester and a day in Edinburgh conducting a mock interview and talking to students from the Scottish Graduate School about applying for post-doctoral fellowships. Have been sleeping badly, end of semester exhaustion, so decide to head out to Loch Lomond and do something different with the day. 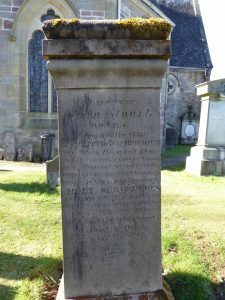 My plan is to follow the tracks of Dr John Stuart of Luss (1743-1821), Pennant’s travelling companion on his second, 1772 tour of Scotland, Highland minister and co-translator of the first Scottish Gaelic Bible: also (perhaps less well known) he was a Linnaean botanist of some distinction. 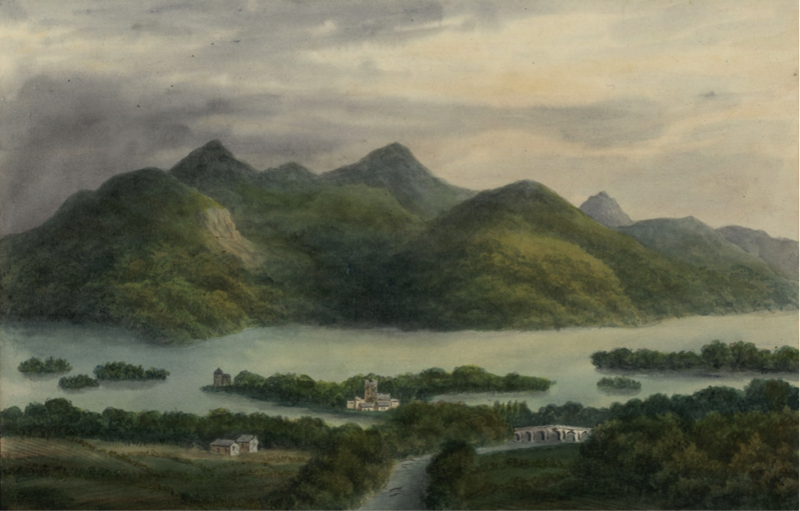 As well as his Gaelic scholarship, Stuart contributed the entry on the ‘Parish of Luss’ to Sir John Sinclair’s Statistical Account of Scotland, 1793-99, so much of what we know about the 18th century village is derived from his pen, as well as from the many travellers who passed through Luss on the long or short tour of Scotland. 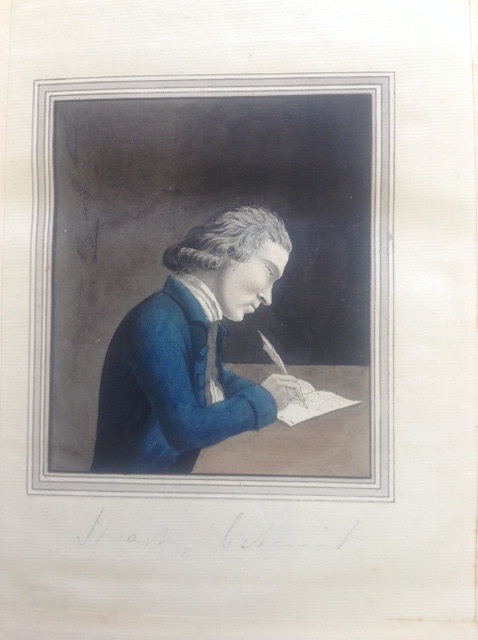 Alex Deans is currently transcribing Stuart’s letters to Pennant from Warwick County Archives, so the time is ripe for us to do some more research on his life and works. I don’t think anyone would reach for the words ‘unspeakably beautiful’ to describe modern Renton, but my eye is caught by a handsome neoclassical pillar topped with a funerary urn beside the war memorial, immediately on the left hand side of the main road. Unfortunately this fine monument to one of Scotland’s greatest writers isn’t as well known as it deserves, partly because it is no longer situated on the ‘high road’ to Dumbarton, as it was before the construction of the dual carriageway bypass. 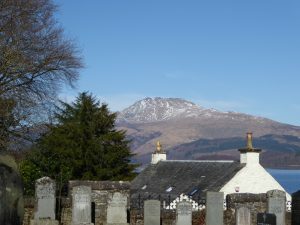 Driving on past the huge Vale of Leven hospital, I see the gleaming snow covered peak of Ben Lomond towering over the urban scene, looking uncanny in the bright Spring sunshine – I remember Pennant’s description of the mountain as being ‘like Saul amidst his companions, overtop[ping] the rest’. (Tour 1769, p. 224) Rejoining the fast growing stream of Saturday tourist traffic heading for the hills and lochs at Balloch roundabout on this beautiful spring day, I make rapid progress to Luss, where Dr Stuart was minister for 44 years, and managed to find a parking space in the car park of one of Scotland’s most popular tourist spots, often called the ‘gateway to the Highlands’. It’s a very pretty place, with breathtaking views over the Loch and its wooded islands, but maybe Ian Crichton Smith summed it up well when he described twentieth century Luss as ‘a picture of a village rather than a true village’. It’s certainly changed somewhat from Dorothy Wordsworth’s 1803 description as ‘a cluster of thatched houses among trees, with a large chapel in the midst of them’, although by then the village already boasted a slate quarry and small cotton mill. (Recollections of a Tour in Scotland, p. 84) It’s nice to see at least five Glaswegian Asian families warming up their barbecues on the sandy beach though, ready for a picnic of spicy delights in the sunshine. I walk down towards the church, and cross the bridge to the Glebe. The water is transparent, and I can see schisteous pebbles gleaming on the shallow riverbed in the bright light. Luss Water runs through shady woods into the loch, and bonfire smoke drifts through the alder trees, while the mountains looming behind the village still show patches of white snow, despite the gathering warmth of the midday sun. The church faces me, not the building that Dr Stuart would have known, but a handsome Victorian structure erected in 1875 by Sir James Colquhoun of Luss to commemorate the tragic drowning of his father and four of his men when their boat was overturned in a winter storm. dating from the time of the Norse occupation of the Earldom of Lennox, which ended with Vikings’ defeat by the Scottish king at Largs in 1263. 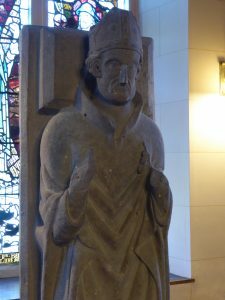 It’s curious that Pennant, who visited Luss in 1769 (without John Stuart on this first visit, unfortunately) and commented on some of the other antiquities, didn’t mention this one, although he did describe a similar hog-back monuments at the ‘Giant’s Grave’ in St Andrew’s Church, at Penrith in England, as well as an illustrative plate. 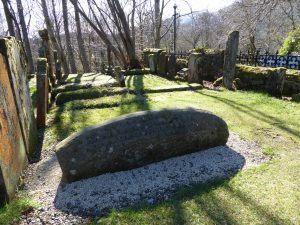 Dr John Stuart, writing in the Statistical Account, remark that ‘in the [Luss] church-yard [are] some stone coffins of considerable antiquity’, although he doesn’t seem to be specifically alluding to the hog-back here. The building before me, even if it looks a bit unlived in (Luss has no resident minister), showed signs of having been extensively refurbished and enlarged since Stuart’s time, probably by the Victorians, if the architecture is anything to go by. Next door was the Luss Glass Studio, so entering, I asked the lady at the counter if the adjacent building was in fact the old manse. She told me that my guess was correct, and I explained my interest in Luss’s 18th century minister, Dr. John Stuart. I had really struck lucky – she introduced herself as Janine Smith, a stained glass artist who runs the studio, and who is also well versed in the history of the village community of which she has been a member for many years. 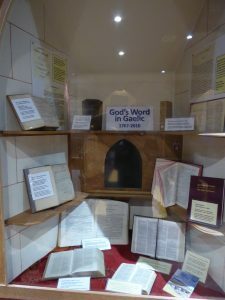 Janine showed me into the adjacent Luss Pilgrimage Centre, which contains an informative display of the history of Luss. 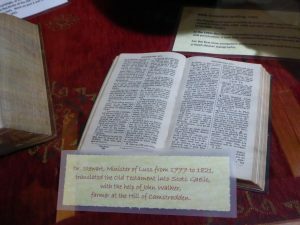 It includes a panel dedicated to Stuart and the work of the Stuarts father and son in producing the first Scottish Gaelic Bible (John’s father, Dr James Stuart of Killin, translated the New Testament, which was published in 1767). Janine was brought up a Gaelic speaker on Tiree before moving to the mainland, and so Stuart’s historical importance for Scottish Gaelic is of great concern to her. Finding that we shared views about Scottish history and culture (as well as indyref 2!) we agreed that too much hot air had been dedicated to warlords like Wallace and Bruce, and not enough to quieter, but nonetheless important historical Scots like John Stuart, a proud Gaelic speaker and a scholar of international importance. Stuart and his father struggled against the tide of ignorance and prejudice that did so much damage to the Gaelic language in the 19th and 20th centuries, and which is only now beginning to be turned back in the first welcome signs of a language revival. 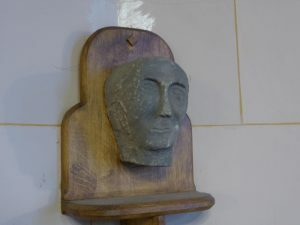 and a powerful ‘primitive’ carved head of the saint in the style of early Celtic sculpture. 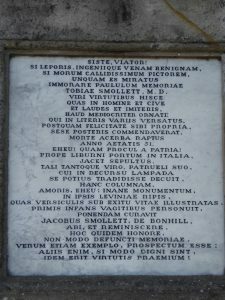 These monuments were reputedly removed from the old church by local people at the time of the Reformation and buried for safe keeping at the cairn-na-Cheasoig (St Kessog’s Cairn) on the loch side near Bandry, the site of his martyrdom. There’s a nice eighteenth century connection, though – two hundred years later, in the late 1740’s, the relics were excavated by a squad of soldiers from Colonel Lascelles regiment who were constructing the military road from Dumbarton to Inveraray, when they opened up the cairn that was blocking the route of the planned road. 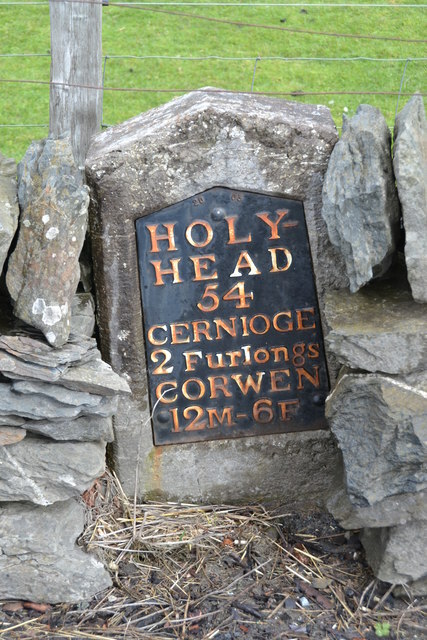 They must have left much of the cairn intact, though, as Pennant writes ‘near the side of the lake, about a mile or two farther, is a great heap of stones in memory of St. Mac-Kessog, Bishop and Confessor, who suffered martyrdom there AD 520, and was buried in Comstraddan church’. (Tour 1769, p. 226) This jogged my memory, and I recalled a fascinating paper given by Prof Thomas Clancy of Glasgow’s Celtic Department at the first Thomas Pennant Workshop in 2013, describing the local important of St Kessog’s Cairn, and its disappearance from modern maps. I can’t believe that these striking relics of this important Celtic Saint are so little known in modern Scotland – I grew up in Strathblane, in adjacent Stirlingshire (where the local Catholic Church is called ‘St Kessog’s’, and there is also a ‘St Kessog’s Well’), but was completely unaware of their existence here in Luss, a village that I have visited many times since boyhood. Blinking in the sunlight as we exited the dark church, Janine took me across to the manse, and showed me into the garden. 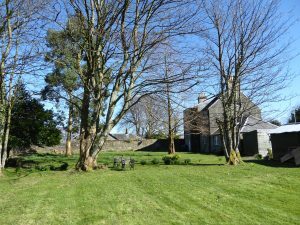 This extensive space, like the manse now a bit neglected, must have been where John Stuart exercised his other great passion – botany. Appropriately enough, a Chinese ‘Dawn Redwood’ (Metasequoia glyptostroboides) or ‘fossil tree’ has been planted in the manse garden, and is maintained by the community. 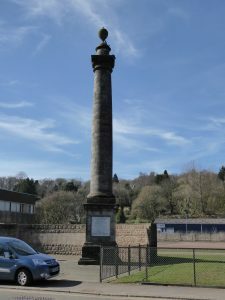 This was clearly the site of one of enlightenment Scotland’s important botanical gardens – another reason for underlining Stuart’s importance, and of the village in which he ministered from 1777 until his death in 1821. Having promised Janine that we’d be back in touch, and drawing her attention to the Curious Travellers website, I headed off for a late lunch and a hill walk, delighted that my unprepared visit to Luss had been so fruitful, and that I’d had the good fortune to meet, entirely by chance, someone who was so well informed about Dr Stuart, and so generous in sharing her information and enthusiasm. 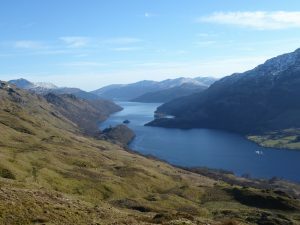 But the rest of the day had more delights in store, as I drove up the length of Loch Lomond to Glenfalloch, parked at Bein Glas farm and, following in the tracks of William and Dorothy Wordsworth, ascended the steep path to Bein Glas waterfall in the now blazing sun. Climbing further up, I followed the ridge southwards, gaining some magnificent views of the Loch and its wooded shores on a bright spring day, with the snow still gleaming on Stob-nan-Choinnich and Ben Vorlich across the glen. Descending a steep but brackenless slope towards Cnap Mor, I joined the West Highland Way in one of its most beautiful passages, and walked back through early primroses, ruined black houses, and lengthening afternoon shadows as the sun sank behind the wall of mountains to the west. This entry was posted in Research Blog on 27th April 2017 by Luca Guariento. For some time we’ve been gathering information about the reception of Pennant’s 1769 and 1772 Tours in Scotland north of the border. By and large Scottish readers were positive, especially when compared with the storm that blew up after the publication of Dr Johnson’s Journey to the Western Islands in 1775. 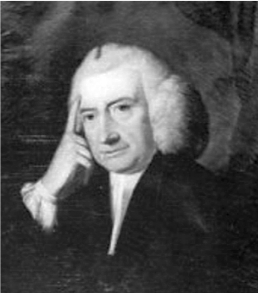 Most of the criticisms that we have found were levelled at Pennant’s treatment of Jacobitism and his comments on the Battle of Culloden, or on ‘proscribed’ clans like the MacGregors. 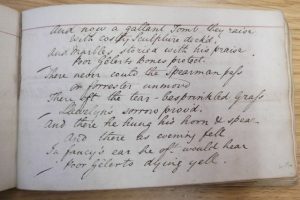 However, when my Glasgow colleague Dr Mathew Sangster alerted me to Emily Savage’s marvellous blog posted on St Andrew’s University Library Special Collections website I was forced to revise my opinion! Its title is ‘Copyright ABCS – “This Book is Very Ill Used”. Student Marginalia in a Tour of Scotland’. St Andrews students adorn the margins with complaints (often in very picturesque terms) about Pennant’s shortcomings as a traveller and travel writer. Sometimes these are plain wrong-headed: he is blamed for not mentioning Oban and Tobermory in his statement that there were no towns in the Highlands between Campbeltown and Thurso (in fact neither town had been founded in 1772). But he is also criticized for credulity regarding Highland superstitions, and for misspelling, and slandered as ‘a blockhead’, a ‘damned liar’ and (worst of all) a ‘Welch goat’. The only mitigating factor appears to be that St Andrews students (who had to take library books home and would consequently read, and scribble on, book with no supervision) were even-handed with their abuse, and many other authors came in for much worse invective than Pennant. This fascinating marginalia also demonstrates, of course, just how widely read Pennant’s Tours were in the period. 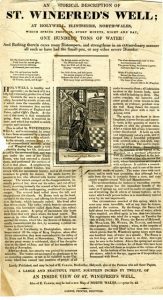 Thanks to Sean Ripington, St Andrews’ Digital Archives Officer, for permission to share this blog and link on Curious Travellers website. This entry was posted in Research Blog on 6th March 2017 by Luca Guariento. Kirsty McHugh’s work has added to the many references to the inns at Cernioge. These illustrate just how many references can survive for just one building, even one in a remote place such as this. Although many of the descriptions are very brief, in combination they provide a valuable record of the inn and the services provided by its occupants. The original Inn at Cernioge was situated in a very bleak location close to one of the highest points on the road between Llangollen (23 miles) and Bangor (30 miles). 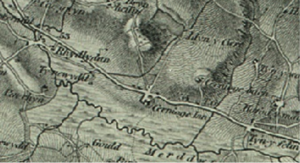 This became part of Telford’s Irish road (London to Holyhead) which was improved at great expense between 1815 and 1825. 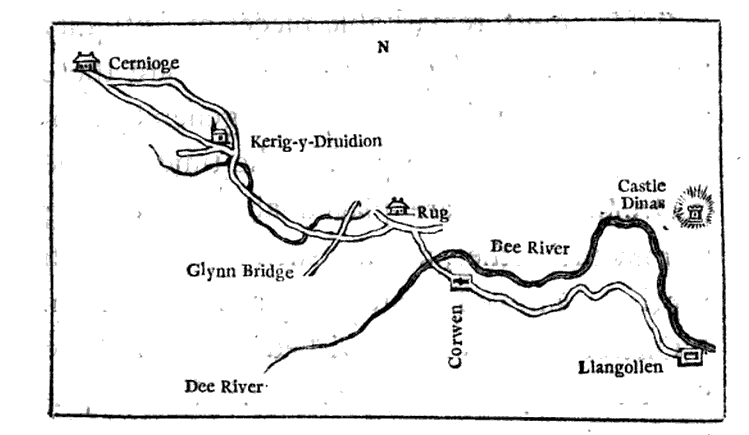 The opening of the new line of road from Pont-y-Padock to Cernioge Mawr through Pentrefoelas was opened on the 8th April, 1821. It seem likely that this is the ‘single’ inn, suitable for only one party of tourists, described by Lord John Henry Manners in 1797 and by Sir Richard Colt Hoare in 1801. 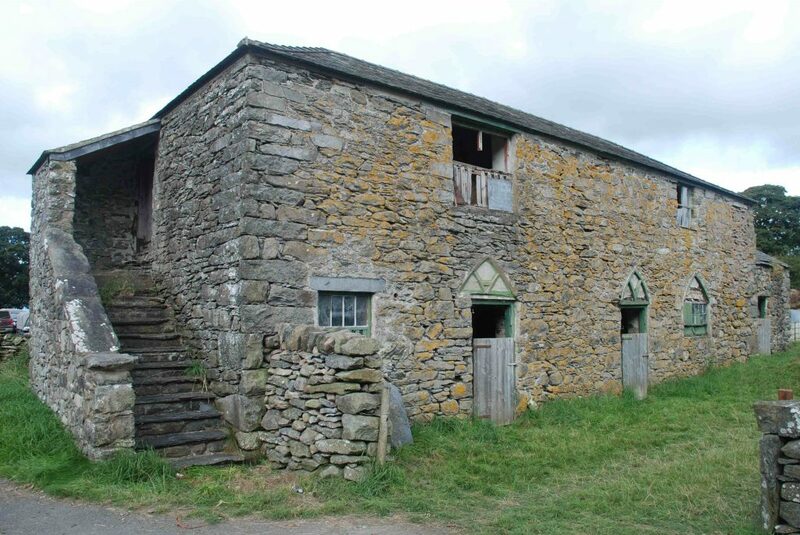 A new inn and large stables were constructed at an unknown date when the road was improved, sometime after 1815, but it is thought that Telford was not responsible for the design of either. Romantic–era Trip Advisor: satisfied guests! Early visitors include the Rev. 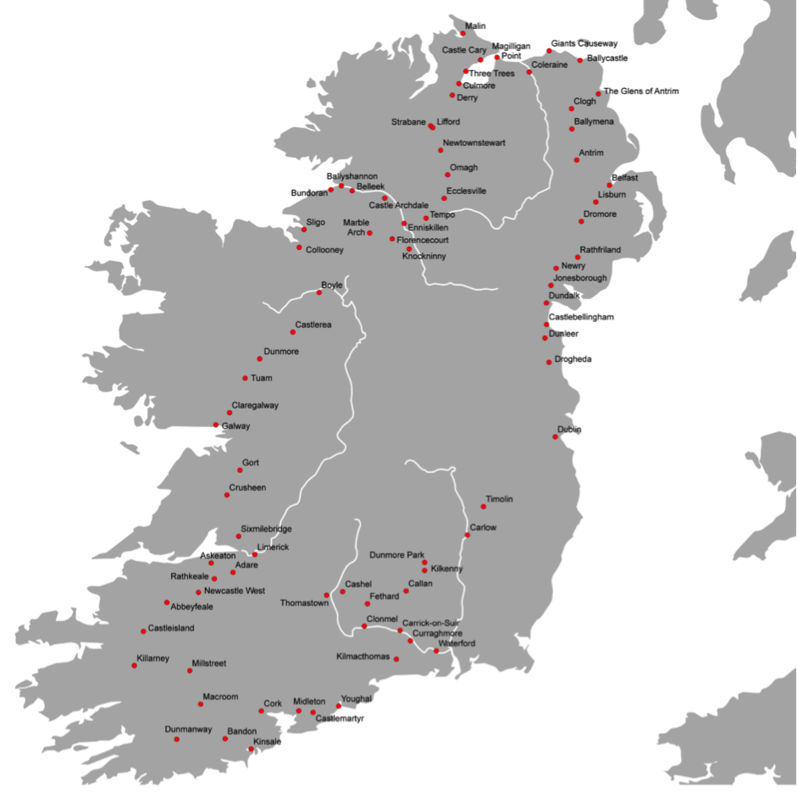 Richard Warner who ordered a freshly killed lamb to be roasted for him and his companion in August 1797 but doubted ‘whether a very keen appetite, produced by a fasting walk of 26 miles, will render it eatable.’ He, like others, described its location as solitary, being a convenient place for coaches to stop on the Irish road. Having previously heard of the excellence of this house of entertainment, I resolved to rest myself for a day or two. This place had a decidedly English appearance, for in the yard were four large ricks of hay (an extraordinary sight in Wales), extensive and well-built stabling, and the arrivals and departures were so frequent as to keep up the bustling excitement of a high thoroughfare. When John Henry Manners, the fifth Duke of Rutland, accompanied by Lord Arthur Somerset and two others, arrived at the inn at 6pm on the 27th September, 1797, they were pleased to find that there was no one else there because it was so small, but surprised that there was no port wine in the house: they expected to be served wine at an inn on a highroad. In 1805, William Fordyce Mavor described the inn as ‘very ordinary, where there is little attention and less accommodation’ and complained that he and his companions were almost suffocated by the fumes from the turf fire. In 1831 Hannah Williams described the inn as ‘large and handsome … in the midst of a wild moorland district. Around the house are some good plantations, intersected with walks, and in the front a lake, on which we noticed some curious foreign geese, which we understood were from South Carolina.’ Tourists were particularly fond of woodland and ‘pieces’ of water, and it is possible that the vegetation had matured by this date. The energetic Thomas Letts (ancestor of the firm who produced Letts’ diaries), made four visits to North Wales between 1832 and 1847. 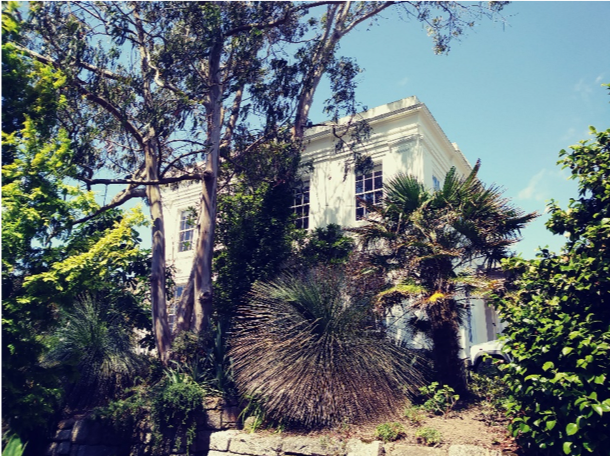 In 1833 he noted that the inn was ‘a dashing place with carriage drive, lawns, peacocks etc.’ In the same year, Catherine Sinclair thought that the garden was neat but the house was only ‘tolerably good’, even though ‘So many travellers were assembled at this place … that it was quite a favour on the landlord’s part to afford us accommodation.’ She also noted the sign above the door of the Inn: ‘By act of Parliament. Licenced to be drunk on the premises’ which was seen at every alehouse along the highroad. Christopher Rawson’s reference to a harp player at the inn in 1817 is one of several. In 1791 ‘A.B.’ was entertained by a blind harper. As he pointed out, most north Wales inns had someone who could play the harp (probably between other duties). They played in the hall of inns for hours on end in the hope of being given a generous tip by the guests – often one shilling. 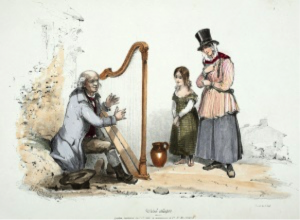 In about 1800 an anonymous tourist rejoiced at finding a harper at the inn and made some comments on the differences between Welsh and English harps. 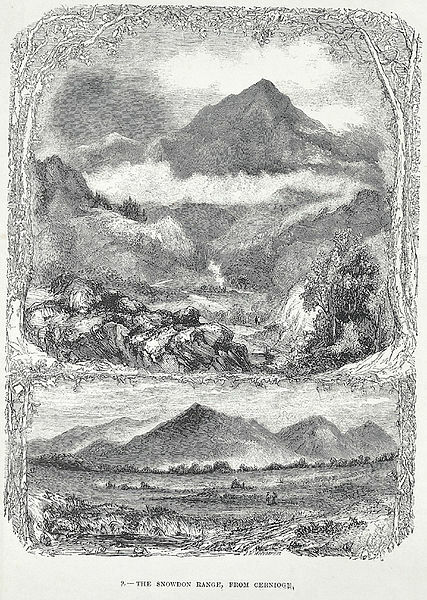 George Bryant Campion (1796-1870) Sketches of the picturesque character of Great Britain from nature and on stone. (London: Ackermann, 1836), no. 5 ‘A Welsh Harper’. In 1816 Dr Samuel Spiker was entertained by harp music played by the landlady’s daughter (presumably Miss Weaver). 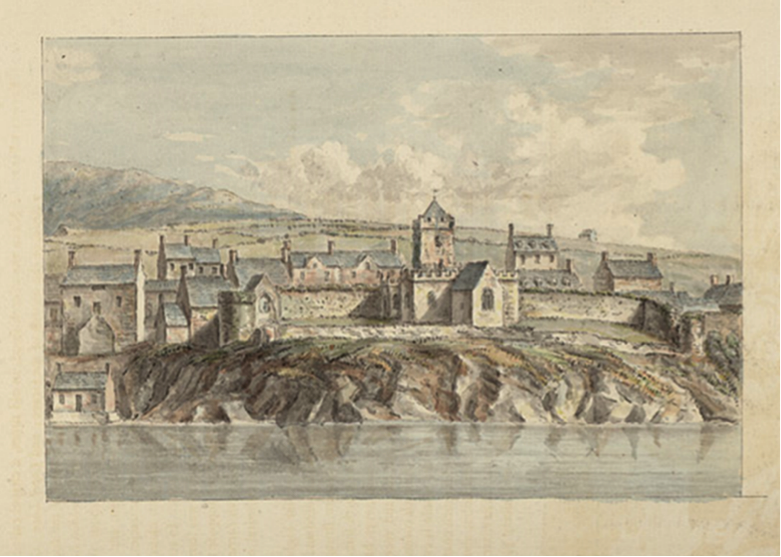 A harper is said to have entertained Princess Victoria there on her journey to Beaumaris in 1832. In 1837 Elizabeth Bower described the harper as ‘another old Welsh man, an even better performer than our friend at Llangollen’ although she didn’t think his instruments was quite up to London standards. The last recorded visitor to the inn was John Parry, (Bardd Alaw, 1776-1851) in 1838. He was the author of ‘An Account of the Rise and Progress of the Harp’ (1834) and it is a great shame that he was not entertained by a harper at this inn, because his comments would have been very well informed (unless he heard a performance not worthy of comment). The building of the A5 across the middle of north Wales displaced the north coast road (now the A55) as the main route to Holyhead for those coming from central and southern England. Likewise, the railway along the north coast from Chester all the way to Holyhead, constructed from 1844, displaced much of the traffic on the A5, leaving some of the inns on this fine road bereft of travellers. John Parry (Bardd Alaw) described the inn as ‘comfortable’ when he stayed there in August, 1838 but it appears that the stage coach service was abandoned in 1839 and the Cernioge Inn victualler’s licence was lost to the Pentrefoelas Arms, three miles to the west, in the same year. Its closure might have been influenced by the fact that Mr Job Weaver, Inn keeper was found to be of unsound mind in 1832. Full details of references to Cernioge Inn may be found here. Dr Samuel Heinrich Spiker, (1786-1858. 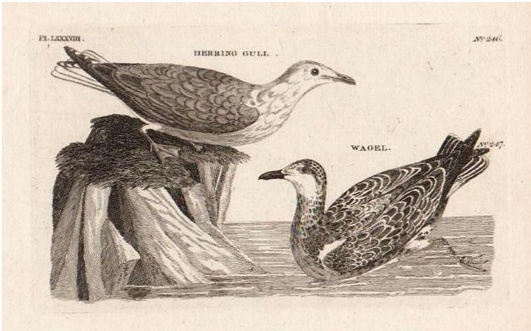 )Travels through England, Wales, & Scotland, in the year 1816. : Translated from the German, (1820) vol. 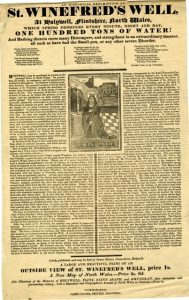 2, p. 43. 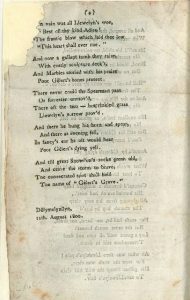 Eleanor Bagot, ‘Journal on a Visit from Blithfield to North Wales’, National Library of Wales, Bachymbyd collection, Uncatalogued. G. Harper, The Holyhead Road: the mail coach road to Dublin, vol. 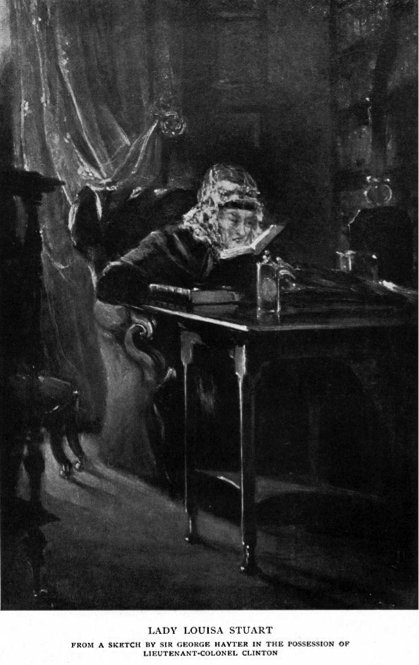 2, (1902), p. 226-229 with illustration. This entry was posted in Research Blog on 1st March 2017 by Luca Guariento. The Doune, Rothiemurchus, ‘Highland Home’ of Elizabeth Grant, with all the comforts and luxuries a Highland Gentleman and his family required (Wikimedia Commons). Increasingly, research about travel and tourism has been concerned with identity. Many diasporic Scots use visits ‘home’ to Scotland as a way to cultivate, perform, and maintain their Scottish identity. My research has focussed on elite Highland women from the eighteenth and nineteenth centuries. It questions how, despite their absence from Scotland for the majority of their lives, they identified as Scottish and more particularly, Highland. Visits to Scotland had the potential to play an important role for these women in displaying their varied Scottish identities. The activities and culture the women engaged in while visiting help to reveal the nature of that identity. While often the women felt they were engaging with Highland life and acting out their identity, these experiences were very much shaped by the broader factors of their lives as ‘British’ elite women, and thus at times appear rather romanticised. Four women from varying backgrounds were chosen as case studies for this research. Lady Louisa Stuart (1757-1851) was the youngest daughter of the infamous 3rd Earl of Bute. She grew up in England and it was not until she had independence as an adult that she began to visit Scotland on a regular basis. Even then, Lady Louisa never returned to the family seat. Next, Georgina, Duchess of Bedford (1781-1853), daughter of the 5th Duke of Gordon. Georgina was born and raised in the Highlands but, as a result of her aristocratic status, socialised in London from a young age. Her marriage to the Duke of Bedford consolidated her life in England, yet she continued almost annual visits to the Badenoch region until her death. The famed Elizabeth Grant (1797-1886), notable for her writings as a nineteenth century Highland woman, including ‘Memoirs of a Highland Lady’, came from the same region. Born in Edinburgh, Grant lived in London, continuing to visit Rothiemurchus for seasonal visits, before returning to Rothiemurchus and Edinburgh to live in 1812. She left Scotland permanently, to return only as a visitor, in 1827, when her family relocated to India where she met her Irish husband. 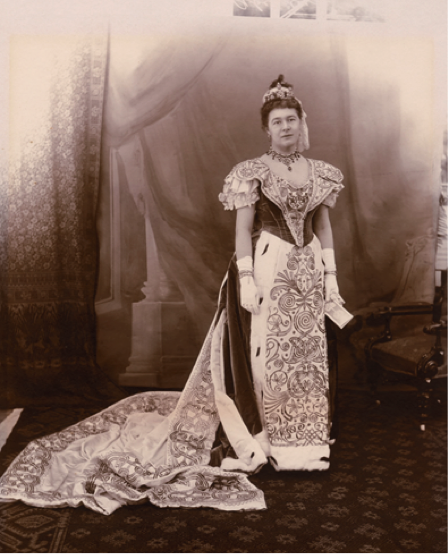 Finally, Lady Aberdeen, daughter of Baron Tweedmouth also grew up in London. Annual trips to Glen Affric as a child helped to cement a powerful relationship with the Highlands, which she continued as an adult. While the experiences of these women do collectively provide an insight into how Scottish identity could be cultivated and performed by the increasingly absent Highland elite women through visits, overall, the extent to which this was done very much depended on their individual status. Lady Louisa Stuart at her writing desk (Wikimedia Commons). Like other visitors to Scotland, for these women, appreciation and exploration of the landscape was a key theme of visits. 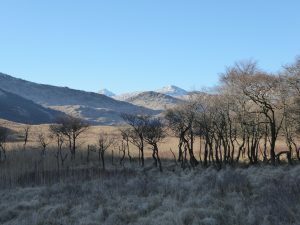 The romanticisation of Highland landscape in particular was an important factor in the growth of popularity of Scotland as a destination for travellers and tourists. The ability to appreciate this landscape was a particularly elite trait, found in the experiences of all four women but most obviously in Lady Louisa’s. To an extent, this made them outsiders, able to step back from the often harsh realities of survival in the Highlands. However, it also had the potential to help these women feel more Scottish. In the ways they engaged with the landscape – navigated the hills and rivers, and endured the outdoors better than others – Grant, Georgina, and Lady Aberdeen could cultivate a sense of belonging. The material culture these women engage with also reveals much about their experiences of Scotland and their sense of identity. Some of the women were able to find pleasure in their interpretation of a simple Highland lifestyle. They abandoned the materiality of their everyday lives, possible due to concepts of the ‘noble savage’. In the most extreme case, Georgina visited small huts in the glen, some with turf rooves! However, it should be noted that although simple, these weren’t without comforts such as servants and a roaring fire to keep warm by, as well as plenty of food and entertainment. 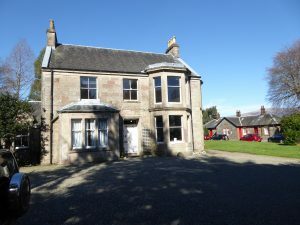 In contrast, Lady Louisa was not able to romanticise this lifestyle, and still viewed such homes as part of the poverty rife in Scotland during her lifetime. From Lady Louisa and Grant’s experiences we find that in reality, late eighteenth-century Scottish elite were making considerable effort to ‘improve’ their houses practically and aesthetically, to make them more luxurious and comfortable, according to wider British elite standards. House surroundings also changed considerably. 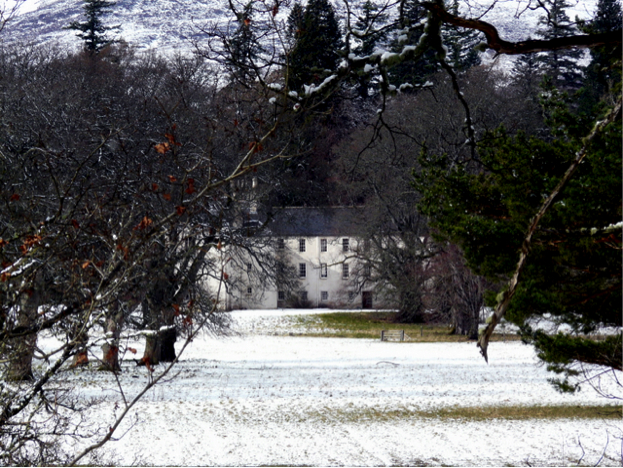 Farm buildings and estate offices were moved out of sight, revealing how the ‘traditional’ role of the Highland laird’s house did not fit with new elite aesthetic principles. This shows how, by the end of the eighteenth century, many elite Highland women lived a life detached from their estates, as the experience of all four women reveal. This is also reflected in their relationship with Highland clothing. 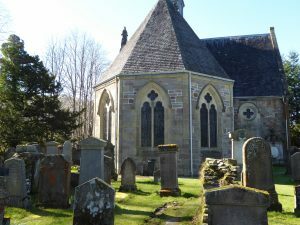 While Georgina abandoned fashionable dress while staying in Badenoch, dressing in the local peasant fashion as a way to display her Highland identity, she was only able to do so because of her elevated social status. This was also a practice reserved for the Highlands. In contrast, Lady Louisa and Grant’s experiences reveal that the elite Highland woman’s aspirations to the fashionable continued while she was living in the Highlands, as well as the difficulties they faced in doing so. Grant’s adult wardrobe was made up of items sent from Glasgow and London. She wore the same dresses in Rothiemurchus as she did in Edinburgh in order to maintain the appearance of an elite woman. This attire, unsuitable for participating in household tasks, reveals how the Highland lady no longer engaged with industry on the estate. However, we do find change by the end of the nineteenth century. The kilt was an important way for Lady Aberdeen’s son to express his Scottish identity, an attire which was acceptable in wider British elite circles by this time, reflecting Scotland and the Highland’s changed place within Britain. Furthermore, as a child, Lady Aberdeen enjoyed weaving shawls while she was in the Highlands. This childhood hobby formed the basis of a real interest for Lady Aberdeen in Scottish craft industries. She was heavily involved in the promotion of such industries, and displayed products at exhibitions across the world. However, while to some extent this stemmed from and reflected her sense of Highland identity, it was also a factor of her role as an elite British woman of her time, influenced by Liberal politics, the Arts and Crafts Movement, and the Celtic Revival. Finally, music and dance had the potential to be particularly nationalistic for these women. It formed an important part of the entertainment for all four women during visits and could be used to perform their Highland identities. For all four women, music – Gaelic song in particular – and dance were closely associated with the Highland character. However, the extent to which they really understood the songs is debatable. Once again, we find a rather romanticised take on Highland life and culture which allowed Scots songs to be incorporated into the cult of sensibility. Furthermore, while these women enjoyed Scottish culture, they were limited as to when they could do so. For example, as a young girl at a party in London, Grant was reprimanded for dancing some Highland steps. These were not considered suitable for the occasion, obviously an activity reserved for when she was “at home in the Highlands”. Overall, it may be argued that visits to Scotland and the Highlands did have the potential to play an important role in the performance of Scottish identity for these elite women once their lives pulled them away from their ‘native lands’. However, their experiences depended very much on their personal circumstances. Visits were overall a temporary manifestation of Scottish identities shaped by their outlook as members of the British elite. Have a look at this interactive map for some more details on these women’s travels. This entry was posted in Research Blog on 7th February 2017 by Luca Guariento.